Integrate activity on your membership site with hundreds of other apps via Zapier. 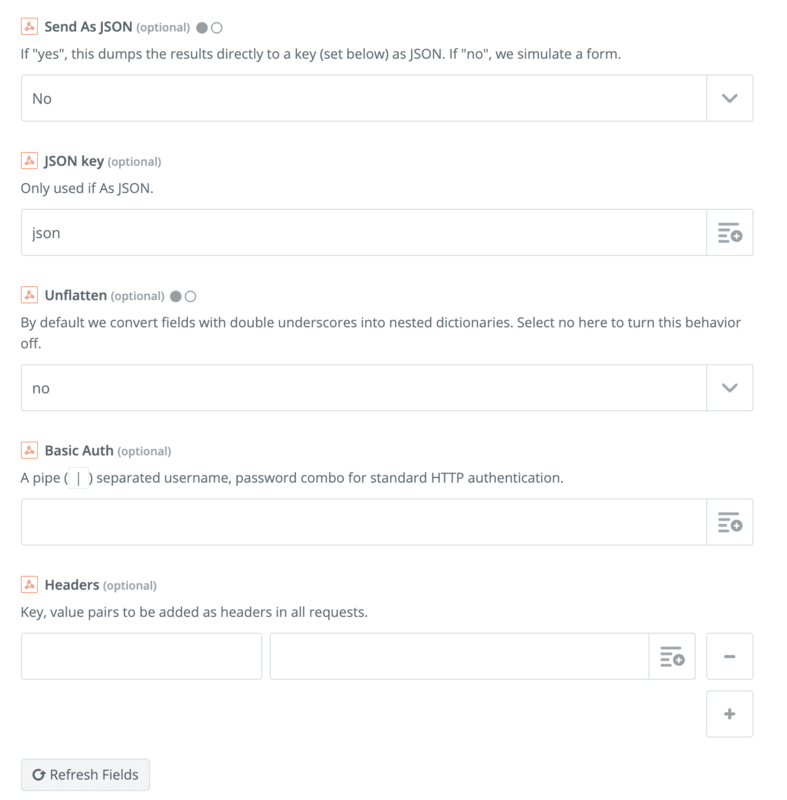 Our Paid Memberships Pro Zapier integration includes the following triggers and actions to send information to Zapier and connect with third-party apps. A “Trigger” will send data to Zapier when changes are made on your Membership site. An “Action” will process incoming data when a change is sent to your Membership site via Zapier and a connected third-party app. Continue reading about the available Triggers and Actions in this plugin and a sample Zap setup for each type of integration. Populating and Updating Google Sheets with new lead information from your Paid Memberships Pro site. 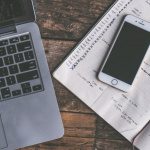 Integrate with a third-party email marketing program, like ActiveCampaign or Campaign Monitor, where there isn’t an existing Add On for PMPro. Send member information to a CRM system like HubSpot or Salesforce. Adding new lead information to an email sent to your Gmail address so you can personally follow up with your members. Create invoices from membership orders in your QuickBooks Online account. Triggers are used to activate the Zap, in our case we will use the webhook option. This option is used for all Zaps that the Zapier Integration for Paid Memberships Pro uses. 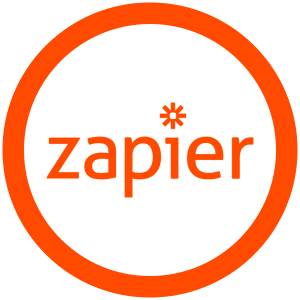 Log in to your Zapier Account or create a new account with Zapier. Select MAKE A ZAP which can be found near the top of the screen. Under the “Choose A Trigger App”, select “Webhooks”. Select “Catch Hook”. Click “Continue”. On the next screen, leave the “Pick off a Child Key” field blank. Click “Continue”. You have successfully created a custom webbook URL. Copy the webhook URL to your clipboard using CTRL + C or CMD + C. This is the value that will be pasted into the Memberships > PMPro Zapier settings page in your WordPress dashboard. 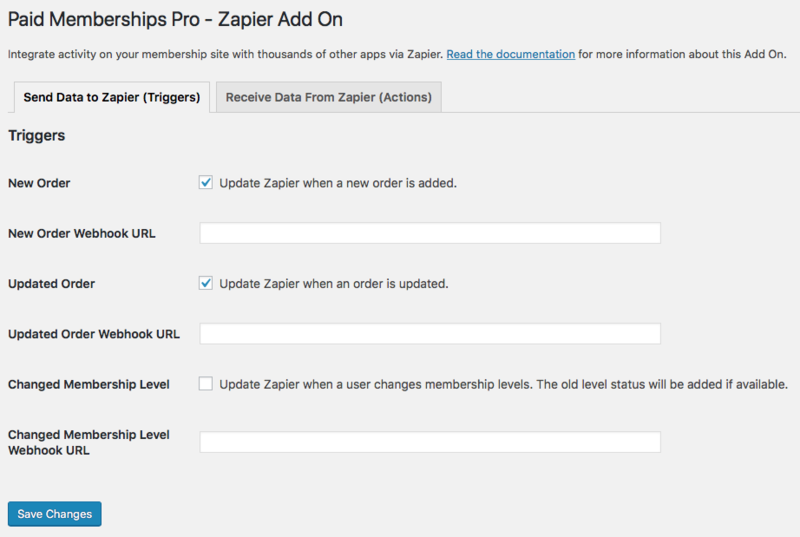 There are three triggers you can use to allow integration with Zapier: “New Order,” “Updated Order,” and “Changed Membership Level.” Triggers can be configured on the Memberships > PMPro Zapier settings page in your WordPress dashboard. Check the box next to the Trigger(s) you would like to use for this Zap. 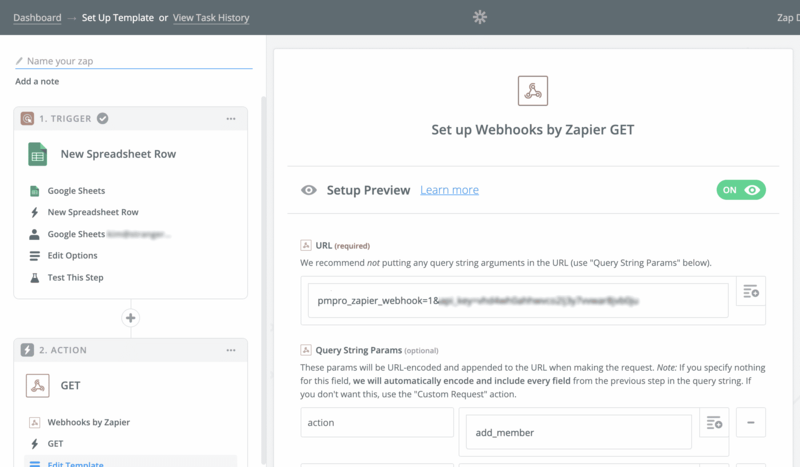 Paste the “Custom Webhook URL” created in the steps above into the Webhook URL field for the Trigger(s) you would like to use for this Zap. You may use the same Webhook URL for all three Triggers or three different Webhook URLs to integrate into three different applications. After pasting the Webhook URL into the appropriate field, click “Save Changes”. Changed Membership Level: Edit a user and change their membership level. New Order: Add a new order via the Memberships > Orders page in your WordPress dashboard. Updated Order: Edit an existing order via the Memberships > Orders page in your WordPress dashboard. If your test is successfully, you can click the “view your hook” to ensure the data is correct and also preview what data will be available for your Actions. 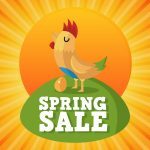 After saving the settings in your Paid Memberships Pro Zapier settings page, you should test that the connection is working properly. 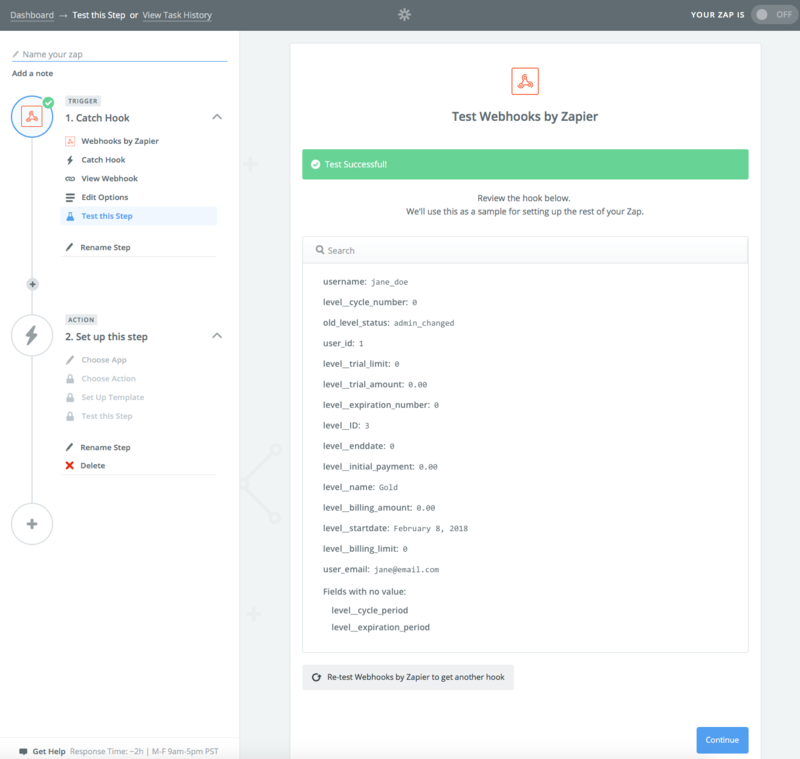 Navigate to your Zapier account to test the webhook. 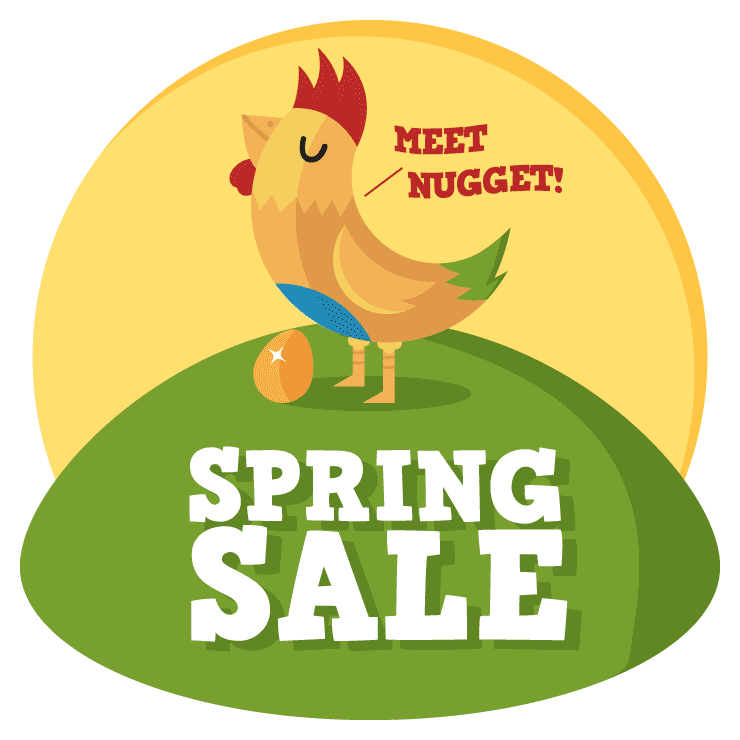 To test a “New Order” trigger, perform a checkout on your membership site. To test an “Updated Order” trigger, change the status of an order to “refunded”. To test a “Changed Membership Level” trigger, edit a user record and modify the membership level. You do have the option to skip this step in Zapier, although it is a very good idea to test at this time so that you can ensure your integration is working properly. Zapier offers over 1,000 services that you can integrate with. For this example, we are going to create a log of data using the “Changed Membership Level” trigger and populate a Google Sheet. You may browse and select a different service based on your needs. On the “Choose an Action App” screen, select “Google Sheets”. Select “Create Spreadsheet Row” and continue. Connect your Google Sheets Account to your Zapier Account. In Google Sheets, create a new Google Sheet to send this data to. You must add column labels in your sheet. These labels will correspond to the data you want to capture during the set up process in Zapier. Data can grouped and added a single column or each piece of data can be added to a unique column. In Zapier, you must select the “Spreadsheet” for this Trigger as well as assign spreadsheet columns to the data available in your Trigger. 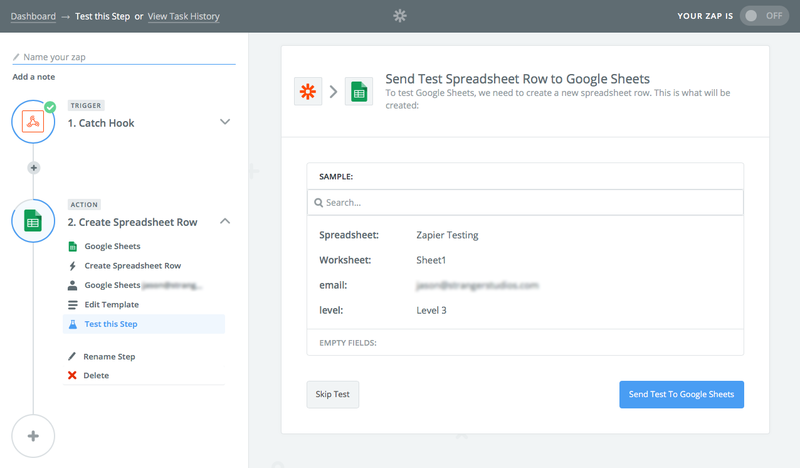 Now run a test to send data to your spreadsheet. If your test is successful, you can select to turn on the Zap on the next screen. As with the triggers, this integration can also receive data from a Zap and make changes to your Membership site. This means that external applications can send updates to your Paid Memberships Pro member data. Navigate to Memberships > PMPro Zapier to locate your Webhook Handler URL and API Key. This information will be used when connecting to a Paid Memberships Pro account in Zapier. There are many apps that can send data into your PMPro-powered membership site. In this example, we are going to set up a Zap that adds a member when a new spreadsheet row is added to a Google Sheet. The step-by-step instructions are listed below the video. Select the “New Spreadsheet Row” trigger. 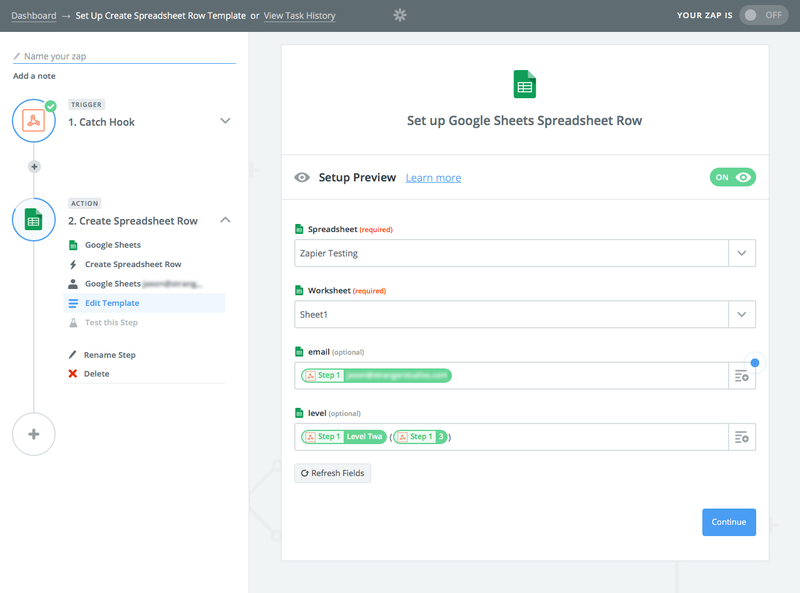 You can test the connection, if desired, by modifying the Spreadsheet directly in your Google Sheet then return to Zapier and click “Get More Samples”. This should update with the new data added to your sheet, thereby confirming the connection is working. Next you must add an “Action App” to your Zap. Select “Webhooks”. This is listed as a “Built-In App” or can be located by the search field. Select “GET: Fire off a single GET request with optional querystrings.” on the “Select Webhooks by Zapier Action” step. 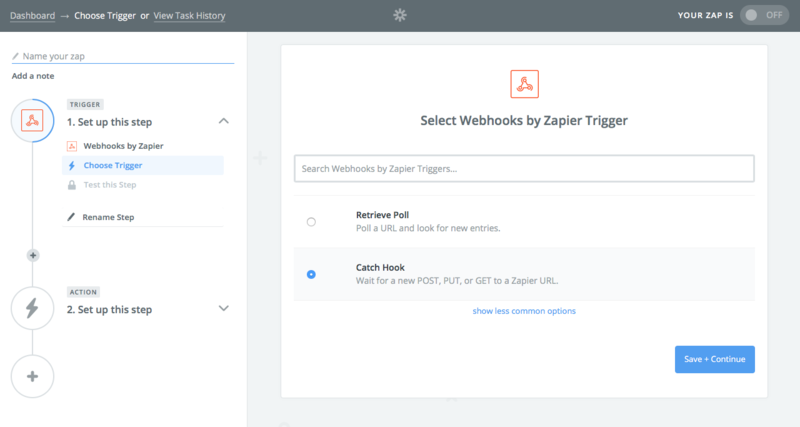 Locate your Webhook URL under Memberships > PMPro Zapier > Receive Data from Zapier (Actions). 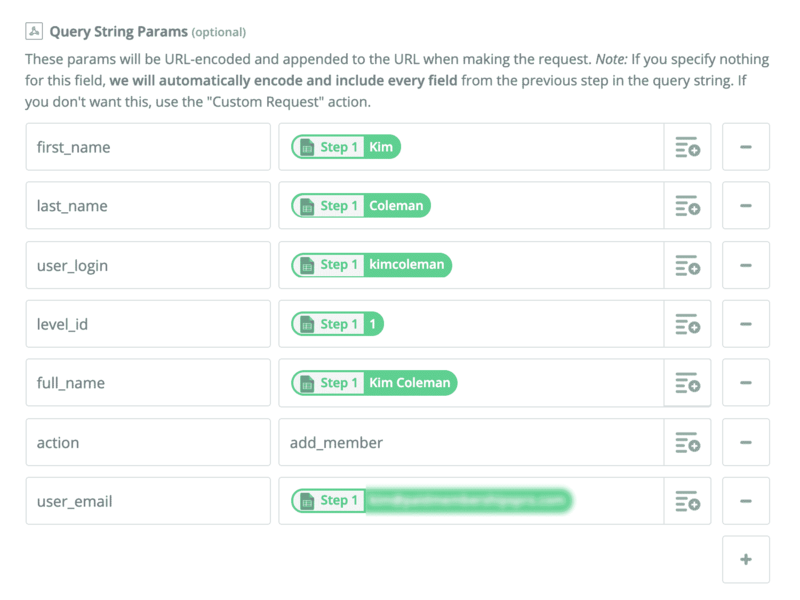 Copy and paste the webhook URL into the “URL” field in Zapier. In the “Query String Params” section, add a parameter with the name action and the value add_member. Other available Actions for this integration are listed separately in this documentation. In the “Additional Action Settings” section, you should set “Unflatten” to “No”. The next step will test your Zap. 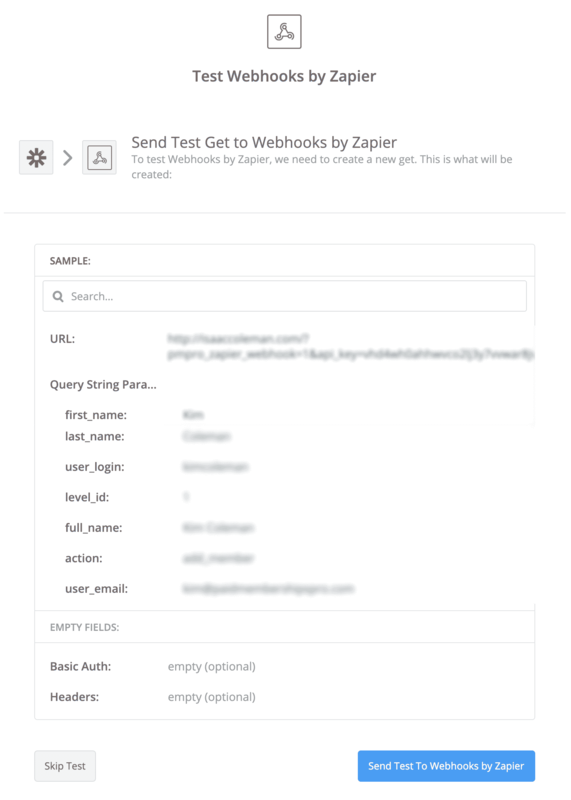 Click “Send Test To Webhooks by Zapier”. Note that the add_member action will only work if there is no existing User in the WordPress site with that matching email address. If successful, a member will be created in the membership site. This Action can add a membership level to an existing member OR simultaneously create the user record with the membership level. Note that user_email and level_id are required parameters; you must also pass in at least one of user_login, full_name, first_name, or last_name. Note that level_id is a required parameter; you must also pass in at least one of the following user identifiers is also required: user_id, user_email, or user_login.